Interested in working with professional athletes or promoting healthy living as an applied sport scientist? This exciting course is your route to a fulfilling career as a high-level sport and exercise professional. Would you like to become an applied sport scientist working with professional athletes or promoting healthy lifestyles? This exciting new MSc is your route to a fulfilling career as a high-level sport and exercise professional. Our MSc will help you raise your game as a new type of sports and exercise practitioner. It has been designed to reflect a national drive to improve the overall calibre of professionals working in the sector. Offered on a full-time or part-time basis, this course can be tailored to match your personal interests and career development plans. You can choose from pathways which focus on your sport and exercise discipline of choice –psychology or physiology. Alternatively, you can combine both for a broader study programme. The programme has been tailored to aid your preparation for applied practice and application for The British Association of Sport and Exercise (BASES) Supervised Experience programme. Our emphasis is on how theory can be applied to practice. You’ll gain first-hand experience through 150 hours on placement in a real-world workplace setting. To organise your placement, you can draw on our wide-ranging partnerships in the sports world. Our network of contacts spans leading football, cricket, rugby and swimming clubs who regularly offer internship and placement opportunities to our students. Our close liaison with Team Derby and the Derbyshire Institute of Sport (DIS) also give you further chances to work directly with athletes. Team Derby is the focal point for the development of sport at the University while the DIS was launched to support Derbyshire’s top athletes. Our academic team includes leading experts in sport and exercise psychology, physiology, exercise and health, strength and conditioning, biomechanics, performance analysis and nutrition. When you enrol, you’ll be allocated an academic mentor who will act as your personal tutor. During your placement, you’ll also have a work-based mentor, an experienced practitioner who will help steer your progress and enhance your employability. Independent research is a cornerstone of this MSc. You’ll gain analytical and research skills as you undertake a substantial investigation into a theme of your choosing. The aim is to develop a realistic and worthwhile research project which will also improve your critical thinking, project management and decision-making skills – all qualities which are valued by employers. You’ll benefit from being part of a dynamic research community at the University. Our staff are breaking new ground in areas ranging from professional practice in sport psychology to human balance control and injury risk reduction. Currently, MSc Applied Sport and Exercise students are carrying out research into blood lactate and running performance for a local running company, Running with Jake, in collaboration with our Human Performance Unit. You’ll hone your skills and conduct research in our exceptional sport and exercise facilities boasting the latest equipment and software for measuring performance, movement, health and fitness. Our laboratories are of such a high standard that they have even been used by Derby County FC for pre-season training programmes. 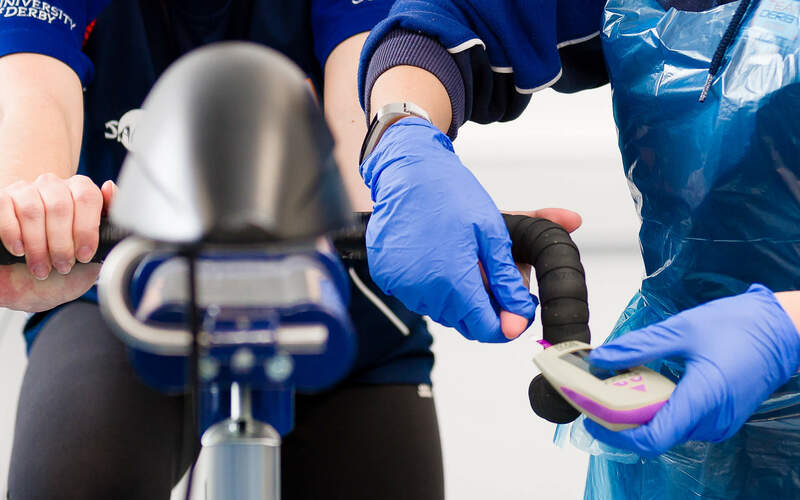 Our Sport and Exercise Physiology Laboratories are fully equipped for biomechanics and physiology analysis while our is the ideal setting for developing practical and coaching skills. We were one of the first universities to invest in a Vicon motion capture system and two Kistler force platforms. You can also take full advantage of our award-winning £10.8m multi-purpose which opened in autumn 2015 to become one of the region’s most iconic sporting venues. It features an impressive sports hall, badminton and squash courts, a 70-station fitness suite, a dedicated fitness studio, climbing wall and indoor sprint track. Our outdoor facilities include a 3G all-weather pitch, tennis courts and a rugby pitch. Each pathway consists of two focused modules in the discipline of your choice, which are then accompanied by core modules in research and practitioner development, as detailed below. The pathway you choose on application is not final, but will help to assess your educational background and experience against the modules you are interested in studying. A range of teaching and learning methods will be used to enhance advanced learning and skill development, which include lecture-seminar style sessions, guest lectures, computer-based sessions, practical laboratory sessions and field-based sessions. Real world learning is an important element of our course, with applied placement and internship opportunities, as well as the chance to develop independent study skills. Learning will take place in our £10.8m Sports Centre, specialist sport science laboratories, and in conjunction with multiple sports based partners in the region. Students will complete both summative and formative assessment throughout the course to include written essays, reports and case studies, oral presentations, and viva-voce exams. Students’ will be assessed on their practical skills, their application of scientific knowledge to practitioner settings, and their ability to critically evaluate the role and requirements of an applied practitioner. Entry requirements for UK students: You will usually need an upper second class honours degree at undergraduate level, in a related subject. Entry requirements for EU/international students: International students should have the above or an international equivalent. If English is not your first language, you will need to hold IELTS 6.0 or above. If you’re interested in pursuing a career centred on sport and exercise science, this MSc offers an excellent learning experience. You could work as an applied sport scientist with clients such as professional athletes or you could embark on broader roles in the community and health sectors where you can help encourage behaviour change and healthy lifestyles. The course also acts as a platform if you want to continue on to complete a programme of Supervised Experience with BASES, which would enable you to gain accreditation as a Sport and Exercise Scientist. Having improved your research skills, you could think about taking your academic qualifications to the next level, by completing a doctoral programme such as a PhD. You could also consider progressing to a role in teaching.